That’s right, folks, it’s October, aka National Novel Planning Month. For the common Nanoer that is, not for me – I’ve had a chapter-by-chapter outline done for this year’s Nano since the end of September. But I still have some planning ahead of me, because I am the official-unofficial Nano Planner for the University of Toledo Writer’s Guild. Admittedly, that doesn’t require as much work as would befall, say, a regional ML (municipal liaison), but still: Between five classes, three jobs, a boatload of homework, and this being my first year as any sort of coordinator for Nano events, I’m swamped. Kick-off parties might take place before November, to let everyone touch base, meet, and hang out before their month of shared insanity, or they might take place right at the beginning of November. The Toledo-area kick-off, for example, was a week ago, whereas the Writer’s Guild kick-off will be on the first Friday of November. Because our UTWG kick-off will be after NaNo has started, it will really be a big write-in. “Big” in our case meaning “this is the first write-in of the month, so come in and kick-start your novel before school, work, and those annoying people you live with start to bog you down,” not meaning “a lot of people will be there.” Considering we’ve had an average meeting attendance of about four students, I’m guessing a lot of people will not be there, but it’ll be fun and it’ll be productive, and if a couple of new people happen to come join us, awesome. Our write-in will actually be a write-in, in that we’ll while away the hours by sitting at a table with our laptops or notebooks and write with that burst of speed that always accompanies the beginning of the month. In contrast, Toledo-area write-ins are really fun, but they’re not very productive. When someone asks what we do at a write-in, I say, “Well, supposedly we’re writing all together, but really it’s more like we’re helping each other procrastinate.” Not to cast disparagement on these write-ins – I love going to them. It’s how I made friends in Toledo last year. But the only time I got any real writing done was the day before Thanksgiving: I arrived late, after work, to find that the few people who had showed up were gone. Sitting alone at the Starbucks in Barnes & Noble, I managed to get 2500 words written in just a couple of hours. But normally I just talked to people. At the end of the month is the traditional “thank God it’s over party,” at which you congratulate the people who won and celebrate the fact that you can stop freaking out about word-count, start spending more time with your significant other and less with your cat (who was your only company for the month, as he, unlike your boyfriend, simply slept on the table while you typed away, rather than complaining about your lack of attention), and otherwise return to a state of sanity. I have our kick-off party and write-ins worked out for the month, but I’m not sure about our end-party. November 30th falls on a Friday, which would be perfect since that’s UTWG’s normal meeting day…but I don’t want to alienate anyone who’s still racing the clock, desperately trying to get to that fifty-thousandth word before the laptop strikes midnight. Maybe the following Monday at Biggby. We’ll see. Happy Nanoing to all, and to all a good novel! 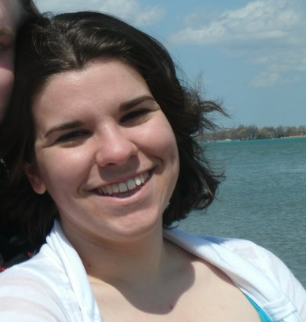 Elizabeth Anderson is an education major at the University of Toledo. She works at the Learning Club of Toledo, the Toledo Botanical Gardens, and Lane Bryant and writes the UTWG newsletter. Her blog, Inkwell, can be found here, or follow her on Twitter. The University of Toledo Writer’s Guild is open to all UT students and alumni as well as high-school students who would like to be honorary members. Any high-school or college-aged students from any schools in the Toledo area are welcome at UTWG’s Nano events. Kick-off party: UT Student Union, room 1507 on Friday, November 2, from 3-5p.m. and 7-9p.m. Meetings: Every Friday in UT SU 1507 from 5-7p.m. Write-ins: Every Monday at Biggby Coffee on W. Central Ave. from 7-9p.m. The UTWG blog can be found here. You can also check out the UTWG Nano thread. Toledo-area write-ins are on Thursdays at the Barnes & Noble on Monroe St. from 6-10p.m. or whenever you get there. There will be no write-in on Thanksgiving. I’ve been making some changes to the site recently, and I figured it’s about time I post an update. Added Guest Post category. Now you can check out every guest post I’ve hosted on this blog here. I’m looking forward to hosting some new guests (possibly even REGULAR guests) soon, so this feature is going to be pretty helpful! Changed UTWG page. If you’re curious about this strange UTWG thing I keep writing about – the UT Writer’s Guild – then you can learn more about it here. You can also find out more about some of our members – and even find their blogs. Added Site page. Now, instead of just bumbling around on my very full About page, you can check out the Site page to find out specific things about this blog, such as how to suggest a Toledo-area establishment to review or inquire about guest posting. Added Challenges pages. If you’re interested in learning about the reading and writing challenges I’ve participated in, both online and offline, you can check out the Challenges page. You can also see my progress in my current 100 Books challenge on the 100 Books in 2012 page. NaNoWriMo and Script Frenzy pages may be added later. If you’ve got some time, feel free to poke around in these pages and leave comments – especially if you’re planning to participate in some challenges this year or if you’ve guest posted on my page before. I’d love to hear from you again! This winter, I’m sponsoring a winter-themed writing contest as vice president of the University of Toledo Writer’s Guild. All types of writing fewer than 17,000 words or 100 pages (screenplay) will be accepted and judged during this competition. Submissions of poetry and short stories are encouraged, but novel or novella excerpts of fewer than 17,000 words that fit the theme will also be taken into consideration. The winner will receive a gift certificate to a surprise location. Runners-up may receive an additional surprise. The theme for this contest is “Winter.” (Big surprise, right?) Your submissions should evoke the atmosphere and/or emotions related to the winter season. Holiday-themed submissions of all types will also be accepted. Always turn in your best work! Make sure you workshop a piece or have a friend give you a solid critique before submitting anything anywhere. I’m a bit of a grammar nazi, and since I’ll be judging, you may want to give your piece a once-over for spelling and grammatical errors before e-mailing or hitting “Print.” The exception to this rule is poetry intentionally written as grammatically incorrect. And trust me on this: I can tell. Adhere to the theme. This theme isn’t as narrow as the theme of the last contest, so it’s nice and flexible! Submissions will be accepted in print form delivered during a UT Writer’s Guild general meeting on or before December 9. Digital submissions in PDF form to feliza.casano@rockets.utoledo.edu will be accepted until Sunday, December 11 at midnight. Please include a cover letter with information about you, your writing, and how you heard about this contest. As I gear up for NaNoWriMo with the rest of the UT Writer’s Guild, I’m wrapping up a few of my long-term projects before November. Most of them will start over again in December. I’ve decided to work on a new, as-of-now untitled screenplay project. All I can really tell you is that it’s related to The TECH Project and my first attempt at Script Frenzy in 2009. And that it’ll be much better than both of those things. This month, I’ve been making some excellent progress on my novel The Final Experiment, which is a direct sequel to The TECH Project and takes place one year after TTP’s conclusion. I’m more than three-fourths of the way finished transcribing the novel, but I also have to write two full scenes – including an intense battle scene – and there’s a lot of editing to do before I can do anything else with the manuscript. I’m also working on Knitting, a prompt for my Screenwriting class that’s growing into a slightly larger story. It may go on to do bigger and better things, but for now it’s a 10-minute short film. Augustine is a little old-fashioned. His whole apartment is decorated in neo-Victorian style – but he’s felt for some time now that something’s missing. He finds that missing element in a back-alley antique store: an ornate brass-framed mirror, faintly scratched. Thrilled with his find, Augustine hauls it home only to find himself sucked inside – into a strange, almost Victorian world filled with oil-driven and steam-powered machines. That’s just a brief summary – I have much more outlined! You can also see in my current sidebar a NaNoWriMo widget. I’ll keep my word count updated there, too, so you can check my progress as I make it. I plan to win NaNo for the first time this year! Will you be participating in National Novel Writing Month this year? If so, add me as a friend! You can find me under the username xxfourthelement or in the Toledo regional forums. The University of Toledo Writer’s Guild will host a Halloween party Friday, Oct. 28 at 5 p.m. in the Student Union Room 2562. We’ll have other fun things available as well, so do join in! All members are encouraged to attend. This is a plus-one event (or plus-more if you’ve got more to bring! ), but we do ask that you let us know how many people you plan to bring so we have enough snacks and drinks to go around. The original invitation is extended to members of the UT Writer’s Guild and staff members of The Mill literary magazine. We hope to see you there! Questions, membership inquiries, and requests for music or short stories go to Feliza Casano at feliza [dot] casano [at] rockets [dot] utoledo [dot] edu. As vice president of the UT Writer’s Guild, I’m sponsoring a horror competition for students at the University of Toledo this October. All types of writing, including poetry and fiction, will be eligible for the competition, as long as entries maintain a horror theme. I will also accept submissions in the following genres: dark fantasy, general dark, and suspense. Please limit entries to word counts of 17,000 or 10 pages in total for poetry. We also ask that you present the entries in manuscript format if entering a script or a work of fiction and, if possible, please use double-sided pages. Submit entries via e-mail attachment at feliza.casano@rockets.utoledo.edu with your name and major. If there is any other information you feel is important to include, you may also include that on your cover page or in your cover letter. The deadline for the competition is October 25, 2011. Hello friends and fans! I’ve made some additions, changes, and updates to the site. If anything catches your eye, feel free to check it out or leave comments. I love to get feedback! About: Changed About page to reflect new content. Added UTWG page regarding my work with the UT Writer’s Guild. Added sections on duties and involvement. Changed Writing page to compensate for a variety of changes, including changes to the Indie Toledo series and other works in progress. A few more updates are forthcoming, but these were some pretty significant (in my mind) changes I thought readers may be interested in. What would you be interested in seeing more of? *Edit: This was also my 50th post! Yay!